A crowd mostly having picnics in their own groups opposite Lucky Plaza at Tong Building on 9 March 2014. This has become a popular hang-out for maids as more are getting their days off. SINGAPORE - A joint survey commissioned by the Ministry of Manpower (MOM) and Migrant Workers' Centre (MWC) showed that foreign workers are generally satisfied with working in Singapore. The key findings of the survey were highlighted by Minister for Manpower Tan Chuan-Jin in his speech at the MWC's sixth International Migrants Day event on Dec 7, where he penned his well wishes to migrant workers on a heart installation. According to the statement from the MWC and MOM, the survey was conducted with some 3,500 Work Permit (WP) holders and 500 S Pass holders by an independent survey company between March and July this year. This is the second survey of its kind done, the first being in 2011. The survey found that about nine in 10 foreign workers (87.7 per cent of WP holders and 90.7 per cent of S Pass holders) were satisfied with working in Singapore. A similar proportion (85.7 per cent of WP holders and 93.4 per cent of S Pass holders) would recommend Singapore as a place to work. Good pay, good working and living conditions, and sense of security were some commonly cited reasons. More than seven in 10 foreign workers (76.9 per cent of WP holders and 71.4 per centof S Pass holders) planned to continue working with their current employers after their contracts have expired. But compared to 2011, foreign workers were less likely to be aware of certain employment laws, for instance, that they are not allowed to work for another employer other than the one specified in their WPs; and that they can claim compensation if they suffer permanent disabilities due to work accidents. They were also less likely to receive a physical record of salary payments. More than nine in 10 foreign workers (about 94 per cent) indicated that their working conditions in Singapore were consistent with the promises made by people who helped them to get the job. A similar proportion (about 93 per cent) was aware of the different components of their salary. When faced with employment-related problems, most foreign workers would turn to their supervisors (57.3 per cent of WP holders and 47.8 per cent of S Pass holders) or MOM (25.2 per cent of WP holders and 15.5 per cent of S Pass holders). About nine in 10 (89.2 per cent) of WP holders also expressed confidence that MOM was fair and would be able to help them when they faced problems. However, there were some results which were less encouraging. 74.7 per cent of WP holders, excluding Malaysians, received their In-Principle Approval (IPA) letters4 in English. 21.3 per cent received the letters in their native languages while 4.0 per cent did not receive any IPA letter. About four in 10 (37.4 per cent) WP holders kept both their WPs and passports with them. Of the WP holders who had left these documents with their employers, 42.6 per cent had requested for the documents to be returned to them. Almost all of these requests had been granted. Compared to 2011, foreign workers were less likely to be aware of certain employment laws, for instance, that they are not allowed to work for another employer other than the one specified in their WPs; and that they can claim compensation if they suffer permanent disabilities due to work accidents. They were also less likely to receive a physical record of salary payments. Mr Alvin Lim, Divisional Director of the Workplace Policy and Strategy Division at MOM, said: "We are generally satisfied with the results of the survey, which showed that majority of the FWs are satisfied working and living in Singapore. This is consistent with the results of our 2011 survey as well. We recognise that the situation is not perfect and there is always room for improvement. MOM will look into ways to improve our outreach and educational efforts for foreign workers, so that they are not only aware of their rights but respect the social norms of the communities that they live in." Mr Yeo Guat Kwang, Chairman of MWC said: "Any migrant worker that faces ill treatment and abuse is one too many for MWC. MWC is especially concerned about migrant workers' housing and care, and would like to see better housing conditions. We will continue to reach out and ensure that migrant workers have 24/7 access to help so they do not have to suffer in silence and take matters into their own hands. We sought MOM's partnership in this survey. Now, we need MOM's partnership in addressing these findings. Beyond this, we need a concerted effort from all segments of our community to eradicate unfair employment practices against migrant workers." Many Singaporeans often speak against the presence of foreigners here - particularly the migrant workers. But it is likely that these people may not necessarily care about how these foreigners feel. Youtube channel AnOther Angle first asked Singaporeans what they thought about foreigners here. 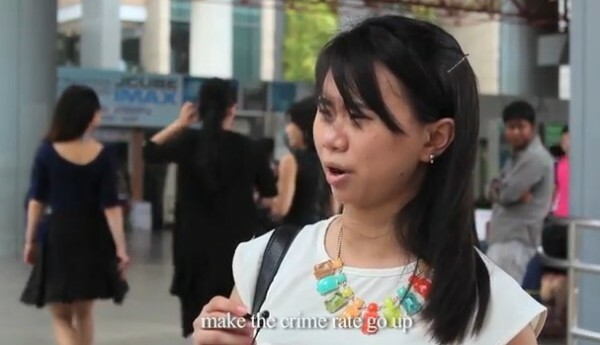 In the video, many Singaporeans expressed unflattering remarks about foreigners and foreign workers in Singapore. AnOther Angle then showed the clip to some foreigners, and asked them how they felt about it. The result of course, is some hurt. One foreign worker commented that the influx of foreign workers to work her was approved by the government. Another foreign worker recounted an incident where she had been queuing at a taxi stand on a rainy Sunday evening. The foreign worker said that a Singaporean woman cut her queue and implied that she is entitled to get a taxi first because she is local. 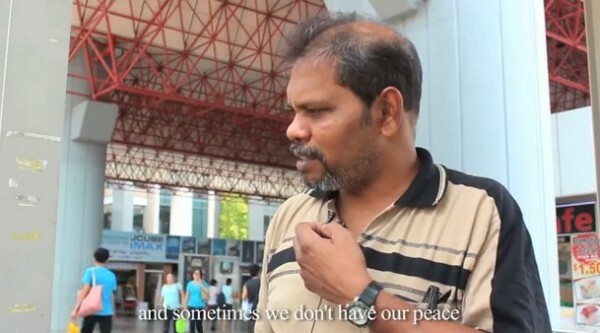 An Indian man also understood that the hate could be generated by some "stupid" to riot in the Little India incident. The female foreign worker explained that many foreigners had just come here to earn a living to support their families in their home country. She hoped that Singaporeans would be able to "see the other side" and be more understanding of foreign workers here, who performed jobs that many locals are unwilling to take up. 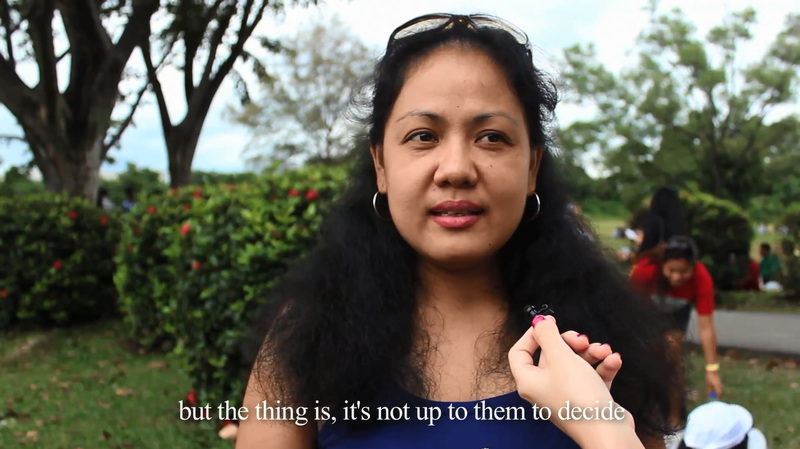 In the initial video, Singaporeans' expressed their displeasure at the influx of these foreign workers. Some said that they did not like and felt uncomfortable at foreigners crowding around. One even said: "We Singaporeans know how to behave when we drink - so these kind of foreigners won't know how to behave." One woman said that she would like to see as few foreign workers as possible.